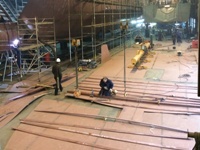 At Wim van der Valk Continental Yachts in Waalwijk, the ‘keel’ of a 37 meter yacht has been laid. 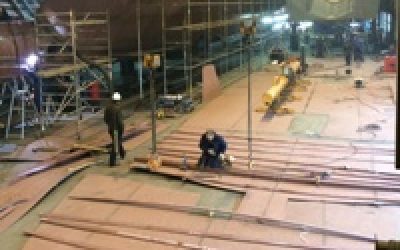 This yacht, a round bilge which is being built with the hull upside down, is the first yacht to be equipped with the revolutionary AntiRoll roll damping system. The Anti-Roll system will be installed this August. The ship will be launched in April 2015.